I wanted to try some small-scale stuff for a change and so pulled my 6mm collection out of storage and we had a small game of Fast Play Grande Armee (FPGA). The scenario was based on the 1809 Battle of Raszyn which is somewhat unique as it is a Napoleonic battle where the French were not one of the main combatants. The background is that as part of the Austrian strategic plan for their 1809 campaign they wished to quickly knock the Poles out of the war so as to have greater freedom on their flanks for future operations against the French and their German allies. Historically the Poles were caught flat-footed, so I decided to have two players control them to reflect their more scattered command. Dan volunteered to run the Austrians and so Stacy and Sylvain had the honour of defending Poland from sausage-eating, lederhosen-wearing tyranny. FPGA has a mechanism whereas each turn can last between 1 and 4 'pulses' (determined by a die roll) which makes time rather elastic and adds a bit of friction and nail-biting for the players. In this scenario the game length was set at 5 turns and the Poles definitely wanted the sun to go down as soon as possible so the full weight of the Austrian attack could not be brought to bear. As it turned out poor Dan had to watch as the first 3 turns melted away with only a pulse played for each. The Austrians were barely at their assault positions and the day was getting late! Feeling the pressure Dan threw a cavalry brigade over a ford on his right flank, hoping to occupy the opposite town and force a bridgehead before the Poles could move to block his efforts. The Austrian hussars made good inroads initially, moving over the river to the opposite bank, but while they were waiting for infantry support the Poles quickly moved a cavalry brigade, supported by artillery, to throw them back. It was then a race to see who would be able to get infantry into the town for control of this part of battlefield. The Austrians had a moment of hesitation (reflected in a bad control roll) and the Poles stole a march and made it into the town to set up a hasty but firm defense. The remainder of the game was spent with the Austrians trying to force their way across the river at three crossing points but with no real success. There were several cinematic moments in the game. 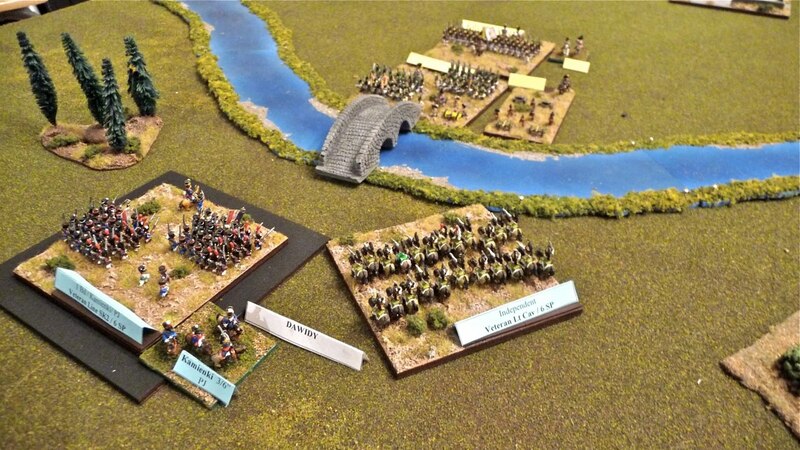 One of which was when a Saxon General who was commanding a brigade of elite Saxon grenadiers (allies of the Poles), safe in his town sector position at the central bridge, got his blood up (i.e. Epic Fail on the control roll) and decided to launch an unsupported assault across the bridge to 'run those Austrian rascals off'. 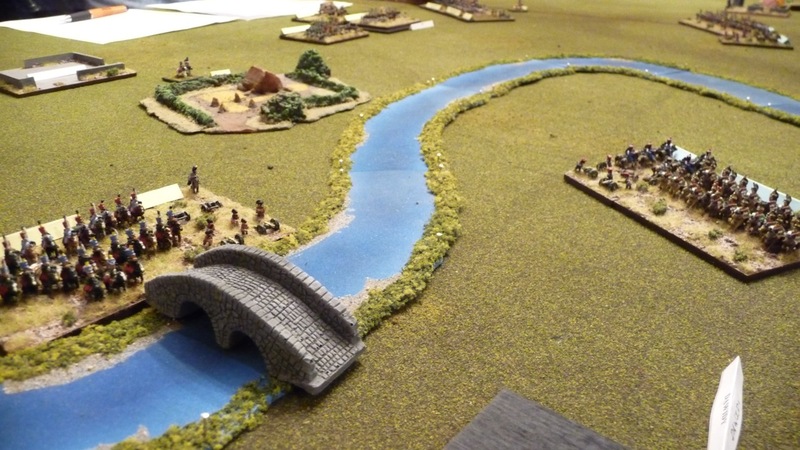 In our mind's eye we could see the Saxons stamping across the bridge in a route-step march column, colours waving, with orders from their brigadier that they go in with muskets unloaded and only use the bayonet. Little did they know that there was a MONSTROUS Austrian brigade across from them with no such romantic notions who let them have it with point blank musket fire. Lets just say there were many grenadier bearskins floating down the river a few minutes later. Nonetheless, this bright spot aside, the Austrians just could not shift the Poles in a meaningful way and the battle ended as a bloody but solid Polish victory. I had streamlined the skirmish rules a bit which seemed to work well, but the artillery still needs to be tweeked in order to be made more lethal as it just doesn't have that 'killer-of-the-battlefield' feel. Next time! Thanks Bayard. Yeah, sorry for the dodgy terrain. Estimating 19th century Polish landscape half a world away in 6mm is impressionistic at best.